Disney Princess Magical Play Kitchen - Only $26.97 + FREE Store Pickup! Check out this Disney Princess Magical Play Kitchen at Walmart.com for Only $26.97 + FREE Store Pickup! (Availability of item and pickup depends on area). 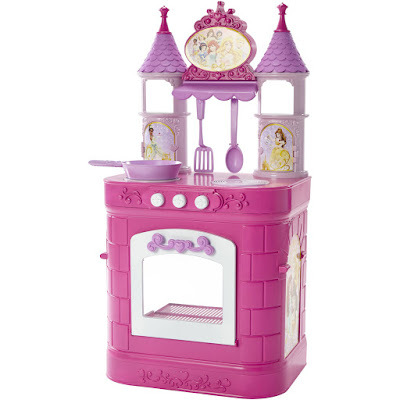 Little ones can pretend to cook, bake and more with the Disney Princess Magical Play Kitchen. Watch them mix and stir ingredients together to whip up their favorite dish, shake a little salt and pepper for the finishing touches, cook on the stove or bake in the oven. This kids' play kitchen includes a sunny side up egg, one cupcake, salt and pepper shakers, two cereal boxes and one juice box. No princess cooking experience is complete without utensils and the set contains a frying pan, a mixing spoon and a spatula. It produces bubbling and sizzling sound effects when the pan is placed on top of the stove to bring this Disney Princess kitchen set to life. It is also decorated with pictures of Belle, Tiana, Ariel and many other classic and popular princess characters. Shelves on the turrets and hanging hooks offer storage for the shakers and the cooking utensils. The set is recommended for ages 3 years and older.